SimpleAction - A simple Action implementation. A SimpleAction is the obvious simple implementation of the Action interface. This is the easiest way to create an action for purposes of adding it to a SimpleActionGroup. The created action is stateless. Creates a new stateful action. state is the initial state of the action. All future state values must have the same VariantType as the initial state. state The initial state of the action. The created action is stateless. See g_simple_action_new_stateful() to create an action that has state. parameter_type The type of parameter that will be passed to handlers for the SimpleAction::signal_activate() signal, or nullptr for no parameter. All future state values must have the same VariantType as the initial state. If the state Variant is floating, it is consumed. parameter_type The type of the parameter that will be passed to handlers for the SimpleAction::signal_activate() signal, or nullptr for no parameter. Creates a new boolean stateful action. state is the initial state of the action. All future state values must also be bool. Creates a new radio action with an integer-based target value. initial_state The initial state of the action. Creates a new radio action with a string-based target value. This is mostly meaningful for identifying the action once it has been added to a SimpleActionGroup. Sets the action as enabled or not. This should only be called by the implementor of the action. Users of the action should not attempt to modify its enabled flag. enabled Whether the action is enabled. Sets the state of the action. This directly updates the 'state' property to the given value. This should only be called by the implementor of the action. Users of the action should not attempt to directly modify the 'state' property. Instead, they should call g_action_change_state() to request the change. If the value GVariant is floating, it is consumed. value The new Variant for the state. Sets the state hint for the action. 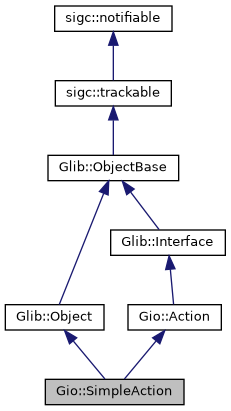 See g_action_get_state_hint() for more information about action state hints. state_hint A Variant representing the state hint. Indicates that the action was just activated. parameter will always be of the expected type, i.e. the parameter type specified when the action was created. If an incorrect type is given when activating the action, this signal is not emitted. Since GLib 2.40, if no handler is connected to this signal then the default behaviour for boolean-stated actions with a nullptr parameter type is to toggle them via the SimpleAction::signal_change_state() signal. For stateful actions where the state type is equal to the parameter type, the default is to forward them directly to SimpleAction::signal_change_state(). This should allow almost all users of SimpleAction to connect only one handler or the other. parameter The parameter to the activation, or nullptr if it has no parameter. Indicates that the action just received a request to change its state. value will always be of the correct state type, i.e. the type of the initial state passed to g_simple_action_new_stateful(). If an incorrect type is given when requesting to change the state, this signal is not emitted. If no handler is connected to this signal then the default behaviour is to call g_simple_action_set_state() to set the state to the requested value. If you connect a signal handler then no default action is taken. If the state should change then you must call g_simple_action_set_state() from the handler. The handler need not set the state to the requested value. It could set it to any value at all, or take some other action. value The requested value for the state.